9th games.net BREAKFAST | media:net berlinbrandenburg e.V. 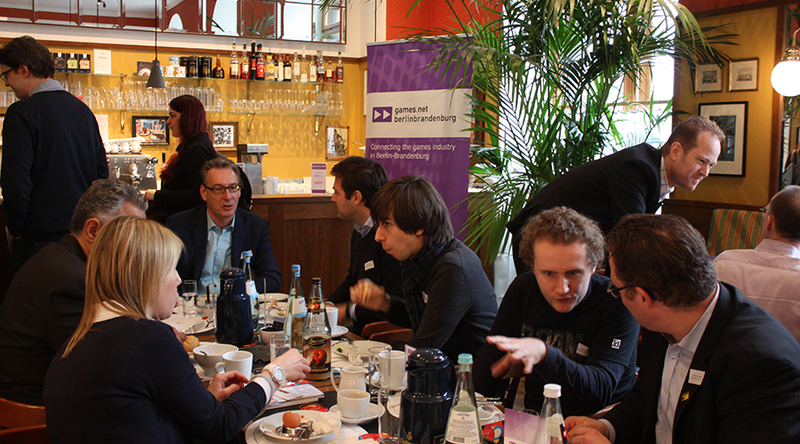 games.net BREAKFAST is the exclusive platform to create key contacts between the relevant players in the game industry: developers, distributors and institutions. games.net, an initiative of the Medienboard Berlin-Brandenburg, promotes the success of the games industry in the capital region. Andrea Peters (media.net berlinbrandenburg), Helge Jürgens (Medienboard Berlin-Brandenburg), Thorsten Unger (GAME Bundesverband e.V.) and Michael Gens (Commerzbank) were proud to welcome around 60 guests to enable the synergies of tomorrow. The first WAKE UP TALK at games.net BREAKFAST focused on E-sports of the capital region was moderated by Tim Rittmann. Michael Haenisch (Freaks 4U Gaming) and Jason Yeh (Riot Games) shared their insights from the last year’s and their vision of the future. After the games.net BREAKFAST the guests had the exclusive opportunity to enter the exhibition no pain no game before the official opening with the Curator Volker Morawe, who guided the group and explained the self-created exhibits: A computer game punishing mistakes by real pain the painstation, a box creating the world’s smallest social network the facebox and some more. Special thanks to our guests, our WAKE UP Talk Participants, our games.net BREAKFAST Partners Amazon Appstore, Commerzbank, GAME Bundesverband e.V., Taylor Wessing and our media partner GamesMarkt as well as the funder of the games.net initiative, the Medienboard Berlin-Brandenburg GmbH – and the Team around the exhibition no pain no gain, Stefan Jahrling, media educator of the Museum of Communication Berlin and Ewelina Dobrzalski from the Goethe Institut Cracow.